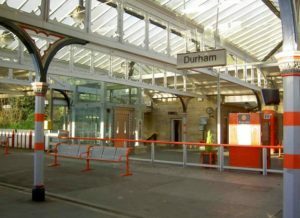 A planning application has been submitted for a platform extension at Durham’s historic grade-two-listed station. Network Rail wishes to lengthen the platform by 20 metres so the station can cope with trains due to be introduced in 2018. Durham Station was designed by Thomas Prosser and is considered one of his best pieces of work. Built in the Tudor Gothic style, the station was completed in 1857, but was enlarged and considerably renovated in the 1870s. The proposed changes would make the platform 230 metres long. The platform, made out of concrete and steel, would also project out over the dual carriageway on Framwellgate Peth. Network Rail, however, insists that there will be no threats to the fabric of the historic station or significant inconvenience to road users. Network Rail has already won planning permission to modify the station, but has submitted an improved version of its original plans, which it says will be more visually pleasing and will cause less disruption to road users during the building process. Network Rail says the platform extension is necessary to accommodate new Intercity Express Programme trains. The trains, which are built in Newton Aycliffe, have 10 carriages. Some trains will be electric, others bi-mode (meaning they are both electric and diesel-powered). The trains will be introduced on the Great Western Main Line at the end of 2017. Virgin plans to start operating the trains on the East Coast Main Line in 2018, beginning the process of replacing the current 125 fleet. It is hoped the Intercity Express Programme trains will increase capacity and help to improve punctuality and reliability.